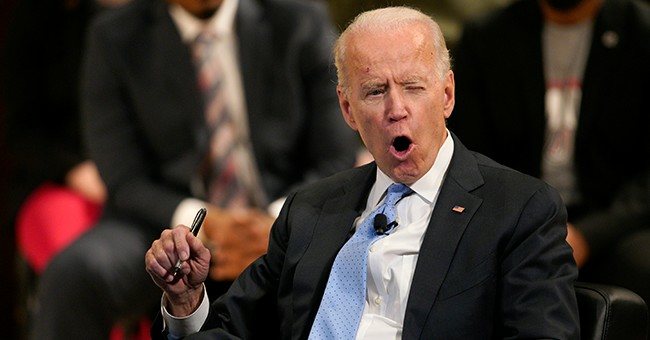 Former Vice President Joe Biden made a slip-up saying that he would run for the 2020 presidential election. Whether he does or doesn’t will depend on what he says later, but during his tongue-twisting remarks, he mentioned that he had a more progressive record than anyone else who is running. “I have the most progressive record of anybody running…of anybody who would run,” Biden said in Delaware. On Sunday CNN host Jake Tapper spoke on-the-air with another 2020 candidate, Sen. Amy Klobuchar (D-MN), about Biden’s claim. "So putting the slip-up aside about ‘would run' versus ‘running'—and he's obviously going to run—is that true? Does Vice President Biden have the most progressive record of anyone running?" Tapper asked. Klobuchar suggested that the progressive superstar doesn’t have as progressive of a record as he declared. "He has been running things for a long time as a senator and then as vice president. I'm sure he'll be able to point to some major accomplishments that are progressive," Klobuchar said. "And then he'll have to explain things that weren't as progressive." Klobuchar added that every Democratic candidate running for 2020 is going to say the same thing about themselves, that they’re the epitome of progressive values. Biden said in January that he regrets working on the bill. "I haven't always been right. I know we haven't always gotten things right, but I've always tried," he said. In 2018, Biden told NBC’s Today that he was sorry for not preventing the “attacks” that came on Hill. "I’m sorry I couldn’t have stopped the kind of attacks that came to you," he said. "But I never attacked her, I supported her. I believed her from the beginning."